Modern edition – an online edition by Clemens Goldberg (2011) is found at the Goldberg Stiftung. Scholarly literature (selection) – Jeppesen 1927/2 (1965); Thibault 1977; Higgins 1984; Gutiérrez-Denhoff 1985; Higgins 1987; Alden 1999; Goldberg 2001; Nagy 2009; Alden 2010 - especially the very detailed description in Appendix A (A4- PDF). Small parchment chansonnier, c. 18 x 12,5 cm, 77 folios (of originally at least 80, probably 88), modern binding (19th century), 10 fascicles; in fasc. 1–9 we find the original roman-numeral foliation entered before losses of leaves; modern Arabic foliation in fasc. 10. The pages are ruled in rose ink with eight staves per page, music and texts stand now in faded brown ink. Painted initials decorate all pieces copied by the main writer. A fascicle following fasc. 9 is probably lost. Fasc. 10 originally contained only extra empty ruled pages (the outer pages of the fascicle without staves) for the addition of new compositions. The main writer (Nivelle) has copied all the pieces in fascicles 1-9 leaving only the first opening empty. Later hands (NivelleB-D) have added songs in fasc. 1 and 10. A later user has erased or rubbed out all music, text, and composer attributions on ff. 2v-3v, 6v-7, 48v, 49v-51), while the illuminated initials and the voice designations were left untouched. The contents of these pages and other erased elements are to some degree made visible through the ultraviolet photographs published in the facsimile edition by Paula Higgins (Minkoff, Geneva 1984). Fasc. 1, ff. 1-7v – in this fascicle the middle bifolium, ff. 4-5, is missing, which causes the losses of the tenor and contratenor parts of the second section of the unique bergerette »Ma plus amée de ca monde« on f. 4, and the whole first section and the superius of the second part of Ockeghem's »Fors seulement l’attente que je meure«, which should have been on ff. 4v-5v. Also folio 8 has disappeared making the unique four-part bergerette »Se je demeure despourveue« (no. 5) incomplete. Furthermore, a later user has erased the contents of folios 2v-3v and 6v-7). The main copyist left the first opening without music (ff. 1v-2); no. 1 was later added by hand NivelleB. Fasc. 6, ff. 41-48v – on the last page music, text and composer attribution has been erased. Fasc. 7, ff. 49-56v – similar erasures appear on the first two openings (ff. 49v-51). Fasc. 9, ff. 65-72v – ends with the superius of the first section of a bergerette attributed to Fede »Mon cueur et moy avons sence« (no. 59, f. 72v), which probably continued in a now lost fascicle. Fasc. 10, ff. 73-80v - originally an empty fascicle with staves ruled on seven openings; the outer pages (ff. 73 and 80v) were blank. Filled out with music by later hands (NivelleB-D). 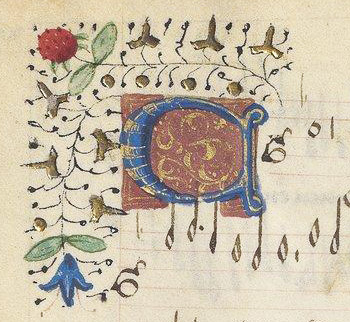 Above the upper voices for the songs nos. 60-64 entered by hand NivelleB somebody has written “par despit”, which in this connection must mean “forbidden”. However the warnings were later again erased. All the pieces copied by the main writer are decorated with painted initials in camaïeu d’or style, in alternating red and blue colours with gold, occasional depictions of creatures and faces, floral borders in green, blue, red and gold (see fig. 1). This style of decoration links the MS with painter’s workshops active in the Loire Valley (especially Tours and Bourges) in the 1460s and later (cf. Higgins 1984 pp. VIII-IX). The Nivelle chansonnier was produced by the main copyist for an unknown customer. It was completed and delivered. The copyist collected, arranged and copied the repertory filling ten fascicles and he added an extra fascicle (now fasc. 10) containing empty staves convenient for the addition of new songs at the owner’s discretion. He also left the first opening without content so the owner had the possibility of personalizing his book with a special piece of music, or if he wanted to use the chansonnier as a gift, he could have a dedicatory piece added. The copying completed, the loose fascicles with writing were sent to a book painter in the Loire Valley or Bourges for decoration; once returned the book was assembled, bound and delivered. A few years later the chansonnier was again in the workshop of a music copyist. Now a selection of new and attractive songs was added, many of which also appeared in the Copenhagen chansonnier (nos. 1, 60 and 63-65). The second scribe (NivelleB) was probably responsible for the expansion of the repertory, and he was assisted by two colleagues (NivelleC and NivelleD). The next stage is the curious warning “par despit” put in above nos. 60-64, all songs entered by hand NivelleB, – was it the reaction of a dissatisfied customer? Later the “par despit” inscriptions were erased, and maybe at the same occasion several pages had their musical content rubbed out. It looks as if somebody had the intention of making room for new songs, but had to abandon the project. Other changes were likewise performed: for example, the erasure of key signatures in hand NivelleC’s copy of »Tart aura mon cuer sa plaisance« (no. 65), which is quite inexplicable. All this may have happened quite late in the history of the MS – it is remarkable that the now empty and unused pages are free of any sort of pen trials. Debra Nagy suggested that the second scribe, NivelleB, was responsible for the large-scale erasures in the MS (Nagy 2009, p. 20). This theory seems untenable. The later music scribes (NivelleB-D) were evidently all professional scribes who probably would not have initiated such a venture without being able to see it though, for example by having the needed repertory at hand. Also the rubbing of the parchment, which makes the surface almost unusable for writing in ink without further, technically difficult, treatment, points at an amateur owner/user as the perpetrator. The MS does not disclose any information concerning its original owner. On the blank front and back pages and in some places inside the MS we find a wealth of later owner inscriptions, devices, pen trials etc. Only one inscription, “de palacio bit..”, on the front page has been discussed. Paula Higgins interpreted it as “de palacio bituricensis”, that is, a book belonging to the ducal palace in Bourges, indicating where the chansonnier was at least in the early sixteenth century. Furthermore, she speculates that the MS originated in Bourges during the period 1460-65 (Higgins 1984, p. X). For detailed information on the copying, decoration, further inscriptions and later provenance, see Alden 2010, Appendix A4. The fact that hand NivelleC’s copy of »Tart aura mon cuer sa plaisance« (no. 65) was made after the same or an exemplar very similar to the one used by the Dijon scribe for his two entries of the song in the Dijon and Copenhagen chansonniers (see the song) gives us an idea of the time frame for the second layer of entries in the MS. The Dijon scribe’s last activities can - tentatively – be dated around 1474 (se the description of the MS). We must assume that some time had passed before the owner (or a new owner) felt the need for an update of its repertory. Therefore Paula Higgins may be right in placing this chansonnier as the earliest in the group of ‘Loire Valley’ chansonniers as regards the main copyist’s contribution. Taking the repertory in account, including the absence of the music of the young Philippe Basiron, which helps to date the Laborde and Wolfenbüttel chansonniers (see further my article ‘The chansons of Basiron’s youth and the dating of the ‘Loire Valley’ chansonniers’), I would date it as contemporary with the main part of Dijon chansonnier, or maybe a bit earlier, that is during the period 1465-70. This dating reverse the sequence of events sketched in Alden 2010, pp. 125-126. I find that the Nivelle and Dijon chansonniers probably are the earliest, begun during the last years of the 1460s, while Laborde and Wolfenbüttel enter the picture a short time later. Datings in the musicological literature: Thibault 1977, before 1460; Perkins 1979, late 1460s or early 1470s; Higgins 1984, 1460-65; Gutiérrez-Denhoff 1985, hands A-B c. 1460-1470s, hand C c. 1475-1480s, hand D 1480s; Alden 2010, c. 1465-1470s, hands B-D 1480s.